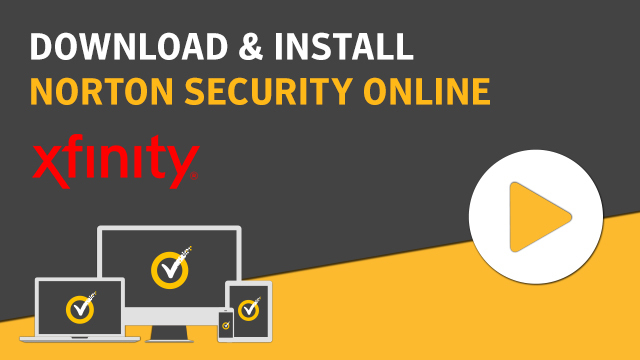 Follow these instructions to download and install the latest version of Norton Security Online on the computer. To install Norton Security Online on a different computer, log in to that computer and then download Norton. Comcast now offers Norton Security Online instead of Norton Security Suite, and it is available at the Xfinity website. You are not required to update to Norton Security Online. Norton Security Online has a new look and feel. However, from a security standpoint, Norton Security Suite has the antivirus and security protection same as Norton Security Online. Norton Security Suite will continue to receive virus definition updates. Depending on your operating system, select one of the following. Go to the Comcast website. Under Norton Security Online, click Download Now. Sign in with the Comcast user name and password. Your PIN will be displayed at the bottom of the prompt. Sign in with your Norton account that you have created for Comcast. You may have created a Norton account if you previously downloaded Norton Security Suite. If not, create a new Norton account. When creating a new Norton account, it is recommended that you add your phone number. This makes performing account related changes easier in the future. When the File Download-Security Warning window appears, click Run. Norton_Download_Manager.exe starts to download to the computer. When the Internet Explorer-Security Warning window appears, click Run. Norton Security Online starts to download to the desktop. If the download is interrupted, there is a file on the desktop to double-click to start the download again. After the download completes, the installation starts automatically. Read and accept the User license agreement. Click Agree & Install. Norton Security Online installation starts. Wait for the Norton Security Online installation to complete. After the installation completes, the activation occurs automatically. If it does not, click Activate Now to start the Activation process. If prompted, log into the Norton account that you created for Comcast. In the Name your Device window, enter a name for the device and click Activate. Wait for the Activation Complete message and close the browser window. In the Your service is activated window, click Done. Open your Mac list of downloads and double-click the install file. In the Mac's security prompt window, click Open. If prompted, enter your Mac login information to allow these changes. In the System Extension Blocked window, click Open Security Preferences. In the Security & Privacy window, click Allow. Click Send a Download Link to email a download link to yourself. If you are on your mobile device, click Agree & Download. If you have sent the link through email, click on the download link to navigate to the Google Play store. Tap Open after the app is downloaded. Read and accept the User license agreement and tap Continue. If you have sent the link through email, open the email on your mobile, and click Download Now. In the Get Started window, tap Install and then tap Open. Click Get, to download Norton Mobile Security from the App store. Read and accept the User license agreement and tap Accept. In the Get Started page, tap Activate. In the Subscription Required page, tap Continue. Type your Norton account credentials and click Sign In.